Another riveting Orphan X novel! 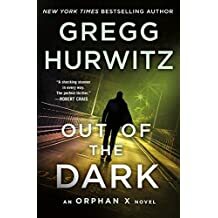 I have personally read and reviewed three prior Orphan X books written by Gregg Hurwitz. I enjoyed all of them and was actually sorry to see them end. Out Of The Dark is another Orphan X book. Orphan X name is Evan Smoak and he lived in a group home for orphans until he was twelve. He was recruited for a top-secret black ops program called the Orphan Program where he learned and mastered a valuable array of lethal and invisible survival skills that would serve him well for the remainder of his life. He has numerous identities and disguises that allow him to travel unnoticed by most governmental intelligence agencies. His works for the US government and other lay people who have been harmed and have no place else to turn. The current President wants this program and all of its participants extinguished for good. Evan has conversely been hired to kill the President. The President has all of the best intelligence and black ops assets at his disposal plus he was the leader when this program came about, but can they manage to ensnare the wily Orphan X? Or will Orphan X kill the President despite his many layers of security? Read it, enjoy it. I did!